Financial aid grants are based upon need and the availability of funds. Grants are made on the assumptions that the family is allocating the maximum amount of resources it can to the educational costs of its children, and that the family has arranged its priorities with educational costs at the top of the list, after necessary expenses. Students receiving financial aid are expected to maintain commendable academic standing and attendance, behavior, effort and citizenship. The students and their families will support the purpose, mission and core values of Saint Andrew Catholic School and are encouraged to be involved in the life of the school community. Funds for financial aid are provided by Saint Andrew Catholic School and the Fort Worth Diocese. 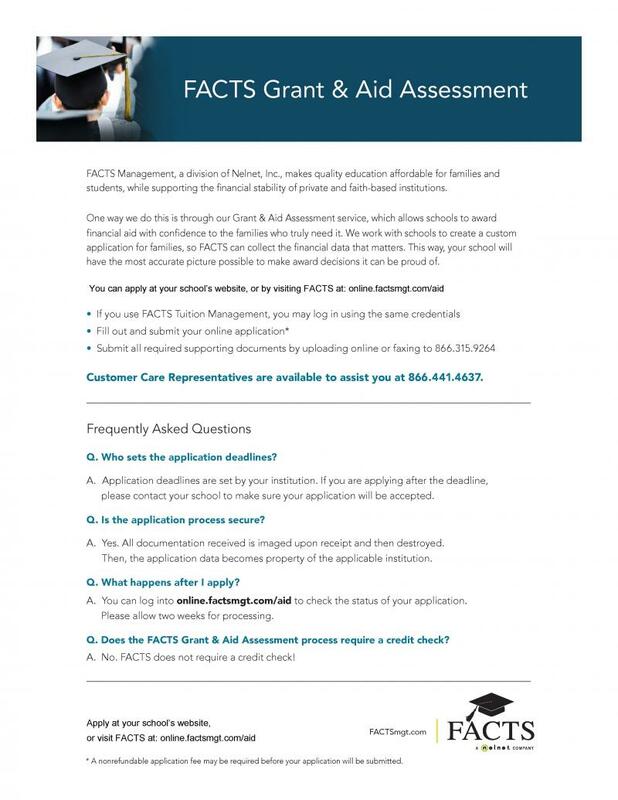 Parents must submit the FACTS Financial Aid Application by March 1st. Please note: You must complete your taxes early enough to meet the March 1st submission deadline. This Financial Aid Application is also available with the re-enrollment application and New Student Admission application. A paper copy of the Financial Aid Application is available in the school office. Financial Aid applicants are notified via email at the end of May.